The 2012 China (Sanya) International Gala Musical Fireworks Shows kicked off in front of InterContinental Hotel & Resorts on 23rd January, 1st day of the Chinese Lunar New Year. 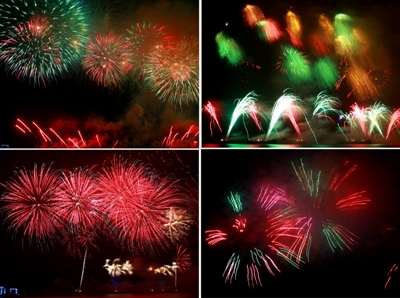 Performed by top fireworks experts from China and UK, over 40,000 fireworks were shot into the sky and exploded into various shapes and colorful pictures, lightening up the sky above Hainan island. World renowned China Meaning Firework presented a musical fireworks show named ‘Thousands Hands Guanyin’ with a selection of brahmana music as a background track, which highlighted Buddhism culture. Meanwhile, CAMM, a world-class firework display company from UK brought a spectacular performance to Sanya citizens with emblems of Scotland. Accordingly, another fireworks show themed ‘Story of Swan Lake’ and ‘Titanic’ is set to be held on 25th January.